Tin mining, tungsten mining takes an important role in the mining industry, detailed information of the mining technology and method as below. Tungsten ore is a rock from which the element tungsten can be economically extracted. The ore minerals of tungsten include wolframite, scheelite, and ferberite. Tungsten is used for making many alloys. Cassiterite is the best-known tin mineral. It has been used as the chief ore of tin from early history throughout the ages, and remains so even today. Some of the economical Cassiterite deposits exist in placer stream deposits where this very heavy mineral collects as rounded waterworn pebbles. Both Tungsten and Tin are heavy minerals and can be mined from rock type and sand type raw material. They are normally mixed in the same processing plant and finally separate in last refining step. Feeding: according to the plant and minerals situation. miners can choose different feeding machines such as vibration feeder, hopper, belt feeder, or wheel loader and excavator. In order to remove big waste stones, Grizzly bar is always required to set before the feeding machine. Washing: Trommel scrubber, screen machine, sand washing process are often used in the washing step. Trommel scrubber is highly recommended to use in breaking down sticky clay from raw material. 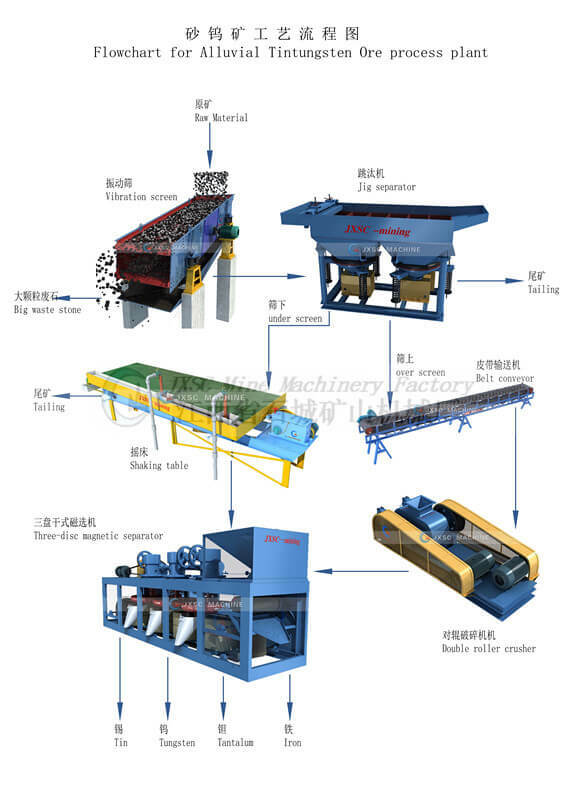 If the raw ore is with little/light clay, trommel screen and spiral wash machine is fine. Sizing: the sieving process is to classify the washed material into a different faction. Useless fraction would be gangue, the different useful fraction would be concentrated by a different machine. trommel screen, normal or high-frequency vibrating screen is frequently applied in the grading step. Concentration: Jig separator is used to recovery coarse free tin minerals. Shaking tables are used to recovery fine free minerals. Drying Processing: Heavy mineral would be concentrated after the gravity method. the heavy minerals may have Tin, Tungsten, Coltan, Zircon, Gold. Magnetic separating is required to separate them. Drying Processing is needed before the process method for the Rock type. Comparison: Different from alluvial minerals processing line. Rock type would be more complicated, so the investment for a rock type tin mining processing plant would be much large. Crushing: The crushing section is designed to remove the undersize between each crushing step to avoid an excess production of fines. Also, a Vibrating Screen is used ahead of the secondary crusher. The secondary crusher is operated in closed circuit with the vibrating screen to ensure a uniform product to the tin mining plant. Sizing&Grinding: Grinding is performed using a Ball Mill operating in closed circuit with Spiral Classifier. This procedure provides a minus 1 mm product for subsequent table treatment. Concentration: The minus -1mm screen undersize is sized in a Hydraulic Classifier for most efficient tabling. Concentrating Tables with sand riffles handle the coarser sizes while the finer sizes are treated on decks riffled for finer sands. The rougher table concentrates are subsequently cleaned on two separate tables. In some cases, a portion of the rougher concentrate can be cut so as to yield some final concentrate not requiring retailing. Drying Processing: Heavy mineral would be concentrated after the gravity method. the heavy minerals may have Tin, Tungsten, Coltan, Zircon, Gold. Magnetic separating is required to separate them. Drying Processing is needed before dry type magnetic separator. Upgrading Process: To separate the heavy minerals, the magnetic machine would be used. In our cases, Three belts magnetic separator is frequently used in Tin mining，Tungsten separation.